Every few months I receive word of a new bike from the New Hampshire workshop of Walt Siegl. 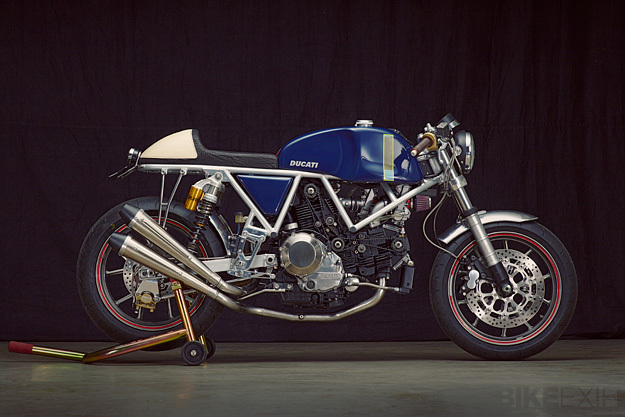 And it’s always a treat to behold—like this custom Ducati 900SS, nicknamed the ‘Riviera Ducati’. Walt’s been working night and day on it for four months now, and it’s a beauty. Power comes from a torquey 900SS air-cooled V-twin, upgraded from 904 to 944 cc with a big bore kit (and given a further boost with a carburetor upgrade to 39 mm flat slides). 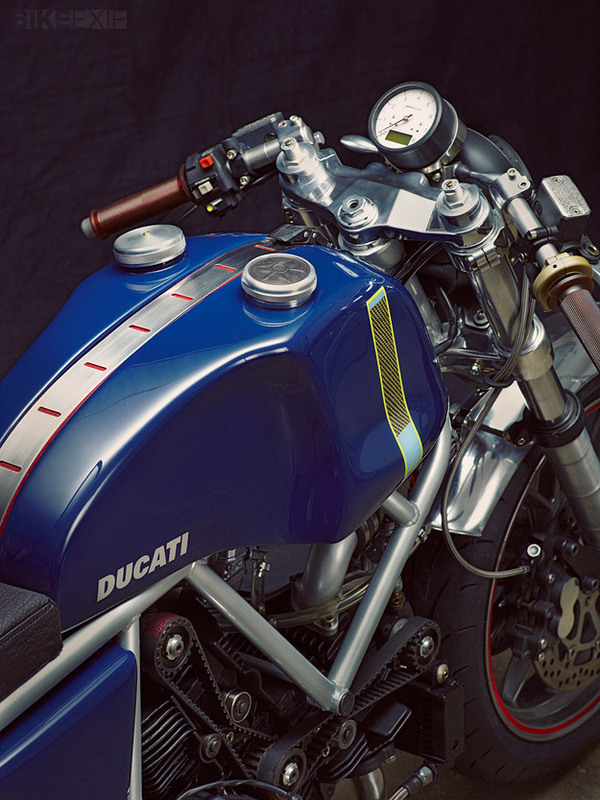 Walt is an old-school craftsman of many abilities, so he also built the frame—using .065″ chromoly steel—and the carbon/kevlar fuel tank, which is influenced by early NCR Ducati bikes. 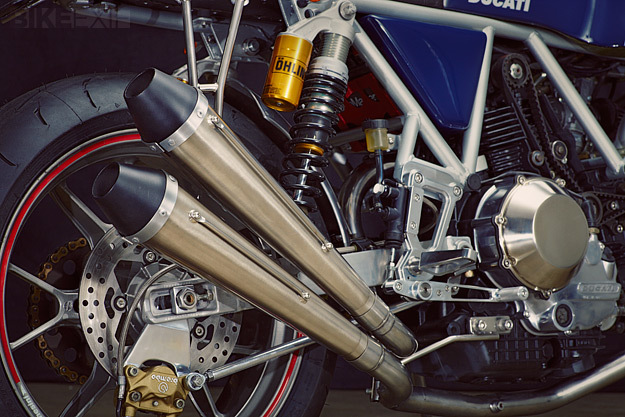 Other unique parts include the stainless steel exhaust system and the rearsets, which are fashioned from 7075 aluminum alloy. Up front are Triumph forks, chosen for their increased offset compared to Ducati/Showa items. They’re re-valved and fitted with new springs to counteract the lighter weight of the bike. The swingarm is an aluminum Ducati item adapted to suit an Öhlins twin-shock setup, and the wheels are Brembo-made Marchesinis from a Ducati 999. (The rear hub and cush drive have been modified to align the final drive.) The instrument is a simple but classy combined speedometer and tachometer from Motogadget. 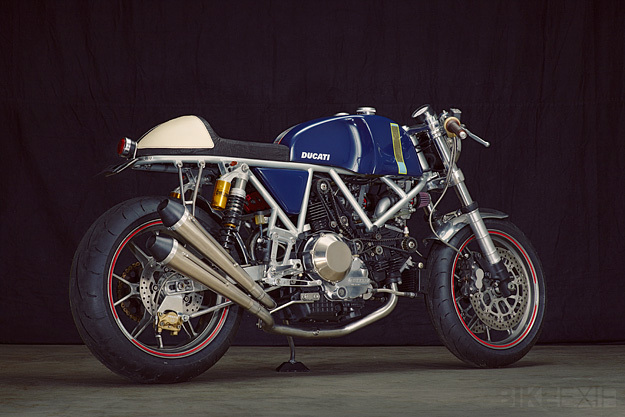 The result is compact and muscular, with a dash of retro superbike aesthetics and café racer styling. 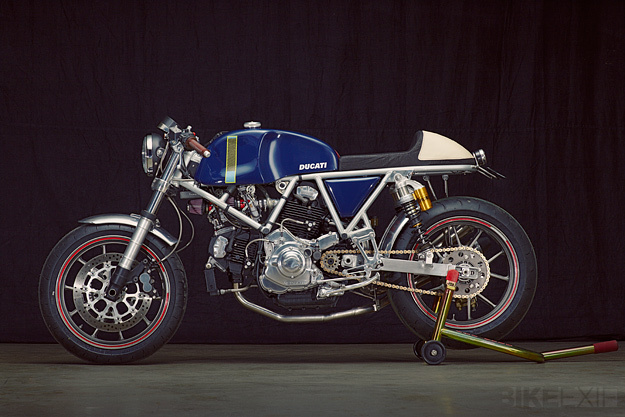 Does a Ducati 900SS get any better than this?